Skinny Mobile is a division of Spark New Zealand Trading Limited and uses Spark's 3G & 4G networks. Skinny only does mobile and broadband, and it’s all prepay. Skinny’s business rationale is to strip everything back. Customers only pay for what they actually want. Skinny says it's based on a model called common sense. Being a prepay brand means not being locked in with a contract. You get everything you need and nothing you don't, plus award-winning customer service. Sometimes things go wrong. Our advisory service is available to provide advice about issues or problems with any Consumer Trusted business. If you're an existing Consumer member you can call us on 0800 266 786 or complete the Request for Advice form. If you’re not currently a member, call us on 0800 266 786 and we’ll help you resolve the issue. "Finally, a communications company with real people who you can talk to." 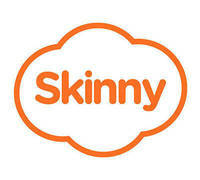 Skinny is a wholly owned subsidiary of Spark (Telecom). I have had really good dealings with Skinny, including being able to quickly talk to a real person in New Zealand who could solve my issue quickly. Great value too, including an easy-to-navigate website. The phone-based app doesn't let you see or change any automatic top-ups, so you have to use a desktop computer for that. It would be nice if this was fixed.